This 22 gauge, approximately 1" sterling silver rectangle will be hand stamped with ANY month from ANY year (past, present or future), and then one day will be highlighted with an oval or a heart AROUND the date, or with a genuine Swarovski crystal OVER the date. 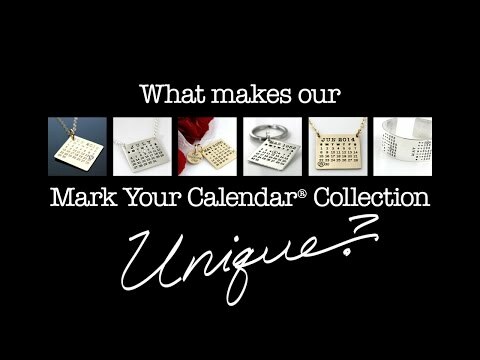 Your calendar comes with a hand-brushed finish and hangs with two small jump rings from a 2.4mm sterling silver cable chain up to 30" long [see ordering options]. Swarovski Crystals: Color chart can be seen here. Chains: The price includes a 16" sterling silver cable chain. Please see our planning tools to view chain styles and a chain length diagram. Stamping on the back: We can stamp up to 18 characters (no more than 8 characters in one line) on the back of your calendar, but it will require upgrading to a thicker sterling for an add'l $10. Please see ordering options.